How Does Flooding Affect Trees? Flooding can have some big negative impacts not just on your home, but your trees as well. With the heavy rains and flooding in our area in the last month or so, there have been so many changes with our environment. Soil erodes, streets flood, pipes burst, and the terrain can be changed irreversibly. Trees, especially, have suffered from the massive flooding. 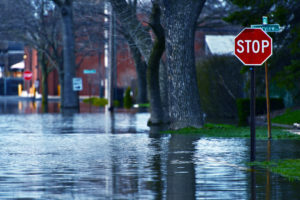 If your property has flooded, or even just experienced very heavy rains, there are some important things to know about how these natural disasters impact trees. Though it is true that trees require water to survive, too much water can saturate their root systems and ultimately lead to their demise. When soil is flooded with an abundance of water, the nitrogen levels there decrease drastically in an hour or two. Nitrogen actually gets leached out the of soil trees planted in soil devoid of Nitrogen can suffer stunted grown, leaf discoloration, decreased chlorophyll production, loss of proteins, inability to bloom or flower, and root death. Ultimately, all of these consequences of flooding can lead to tree death. So, what can we do about it? To rescue your flooded trees, get a high powered battery drill, an earth auger, fertilizer, and compost. Drill holes in the soil that are a few inches wide and almost a foot deep. Backfill the first two inches of the holes with fertilizer and fill the rest up with compost. When flooding happens, the fertilizer releases Nitrogen, replenishing the endemic Nitrogen that is lost from all of the flooding. If you have the means to either buy equipment or hire a professional, deep root fertilization is a great way to ensure that your trees survive a flood. In this process, a slow release fertilizer is added to a spray rig to mix Nitrogen and other nutrients that the trees need. Then, the mixture is pumped at a high pressure below the surface of the soil in order to spray it in all directions to reach all the tree roots. You can actually send a soil sample from your property to your state Agricultural Extension and they will send you a report back detailing so many aspects of your soil. The report will show what you need to help your trees overcome flooding trauma. It will also tell you the target Nitrogen levels your soil should have in order to promote the most tree and shrub growth on your property. Still puzzled about how you can help the trees on your property after catastrophic flooding? No worries, Harford Tree is here to help. 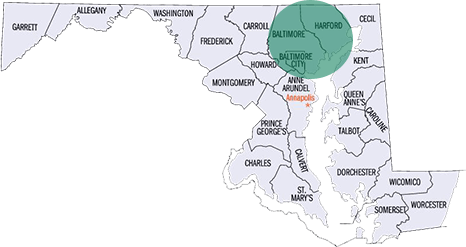 We service Harford County and Baltimore County including Bel Air, Fallston, Perry Hall, Towson, Essex, Parkville, White Marsh and Middle River. Give us a call at 410-592-7321 and if you have an emergency, reach us at 443-250-6649. For updates and tips, be sure to follow us on Facebook, Twitter, and Google+. This entry was posted on Friday, June 15th, 2018 at 10:39 am. Both comments and pings are currently closed.